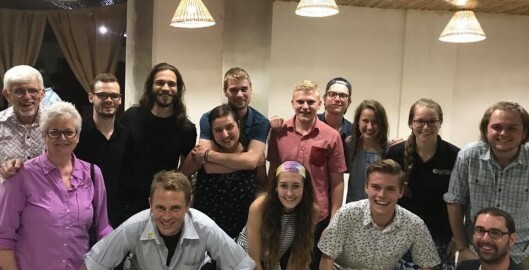 In this guest blog, Kendall College of Art and Design of Ferris State University (KCAD) Collaborative Design student Elizabeth Bush recounts her experience working alongside faculty and students from KCAD and Grand Valley State University this summer to help students and faculty from the National Autonomous University of Nicaragua learn how to design and implement solutions to pressing challenges. While most college students spend the first month of their summer break road-tripping, working, or just binging on Netflix, I, along with a group of students, professors, and interested community members from both Kendall College of Art and Design of Ferris State University (KCAD) and Grand Valley State University (GVSU), ventured to Nicaragua to explore how the power of design extends beyond cultural and geographic boundaries. There, we partnered with professors and students from Universidad Nacional Autónoma de Nicaragua, (UNAN), to better understand environmental and social issues that occur in the country and help drive solutions to those issues. This trip was condensed into a tight timeframe of three weeks. Before we departed, I prepared myself for what would be, in my mind, a “normal” trip—some exploring of the land (hiking, swimming, etc. ), some relaxation, and lots of getting to know my peers in the class. However, it was much more of a learning experience than that. While there were many things we could have focused on during our time in Nicaragua, we narrowed down our learning and exploration to three main topics: rising temperatures (I used to think Michigan summers were brutal, but these temperatures were like nothing I’d ever felt before), water contamination and conservation (we were advised to not eat street food or drink any water not from bottles to avoid becoming sick), and toxic and compact soil. All three issues pertain to environmental and community impacts that Nicaragua experiences year after year. On top of that, while staying with host families, we did not have air conditioning and rarely did we have running water for a shower, two things that feel like blessings after a long, hot day. Before embarking on the trip, I had envisioned witnessing these problems, but didn’t realize how much we’d encounter them personally. After a while, it became natural to empathize with Nicaraguans and the problems that their environment creates for them. When we were not focused on learning, researching, and designing solutions to problems, we were playing. We hiked, kayaked, swam, tasted, talked, and explored the beautiful environment that Nicaragua offers. We traveled around the country to many cities to sample different types of cultures, environments, and living situations. One of the most enriching parts of this experience was being able to talk with peers in Nicaragua. We specifically got to know our translators, college students from UNAN, remarkably well. Making connections in Nicaragua with students, professors, and community members are some of the best things I could have brought home from my experience. The last week of the trip was spent in Esteli, one of Nicaragua’s fastest growing and progressive cities, where we held a design workshop titled “XIII Taller Iniciativa Global de Innovacion Aplicada” or, in English, the “XIII Workshop Global Initiative for Applied Innovation.” Here, our group from KCAD and GVSU led 150 students and professors from all of UNAN’s different locations in practicing the full design process, from researching and comprehending the problem all the way to sketching, prototyping, and presenting ideas. Not one UNAN participant was alike; everyone brought different education levels, income levels, backgrounds, experiences, and interests to the table. This made for diverse conversations and ideas, which in turn made the whole experience that much more engaging. However, with a diversified group came predictable problems that most teams encountered. There was some head-butting when it came to solution ideation, with some members hyperfocusing on a specific solution and ignoring other’s suggestions. Yet when creative minds set aside their differences, genuinely great ideas can result from it. User-centered design was at the forefront of the design process during the workshop. As workshop facilitators, we encouraged groups to remember their target audience’s education levels, main speaking language, and age. Designing and marketing for a target market is key, especially when trying to sell products that are brand new to a market. Nicaraguans, just like other people all over the world, seem to be set in their ways. Traditions are passed down from generation to generation with little desire to change. With these challenges, participants of the workshop managed to tailor their designs to counteract these difficulties. In the end, workshop participants did a stellar job of using limited resources, narrow and occasionally stubborn user groups, and combined group efforts to create and present their ideas and products. It was inspiring to watch peers imagine and make their ideas reality. It was even more inspiring to watch them motivate each other. Boxing up and bringing home this entire Nicaraguan experience was a challenge all its own. The ideas of splitting work and play equally (and learning from both), creating with a diverse group of people despite major design constraints, and always thinking about the target audience during the entire design process will transfer directly into my work here at KCAD. Not only did I make connections with students and professors in Nicaragua that I now consider dear friends, but I also experienced and learned about problems that we do not regularly encounter in the United States.Designing in, and for, a different country is only learned by being there and experiencing the issues first hand. I encourage any student interested in design, travel, and truly “thinking outside the box” to attend this, or any study away opportunity, in the future. Want to share your Collaborative Design story? Contact us to have your blog post featured on this website!